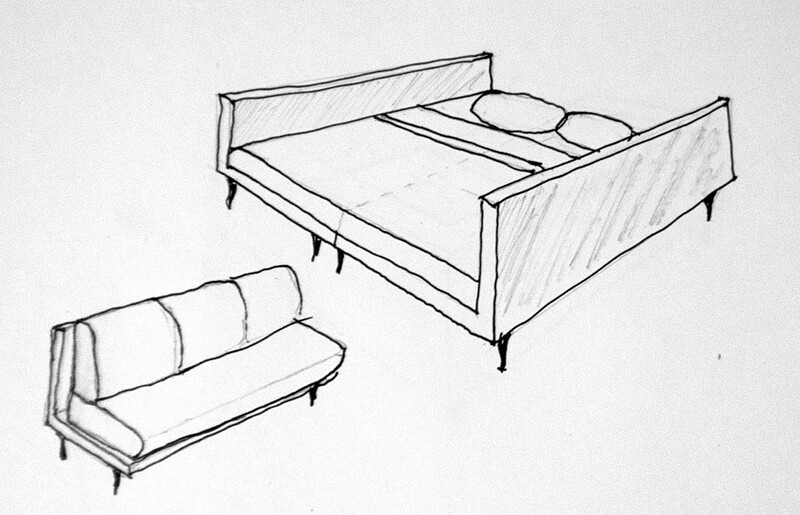 I recently had the chance to design my own furniture. To be honest it was a whim, but when I finished I was surprised at how much I had learned; and humbled at how much I don’t know. It was plenty of fun, allowing for time on the reflection of my own needs and what I wanted to achieve with the furniture. When shopping for furniture I’ve noticed that I don’t have a clear idea of what I want. If you’re like me, you probably visit two or three stores and choose something that fits the space and suits your taste. What happens when you shop like this you often compromise, either on looks, price or functionality. 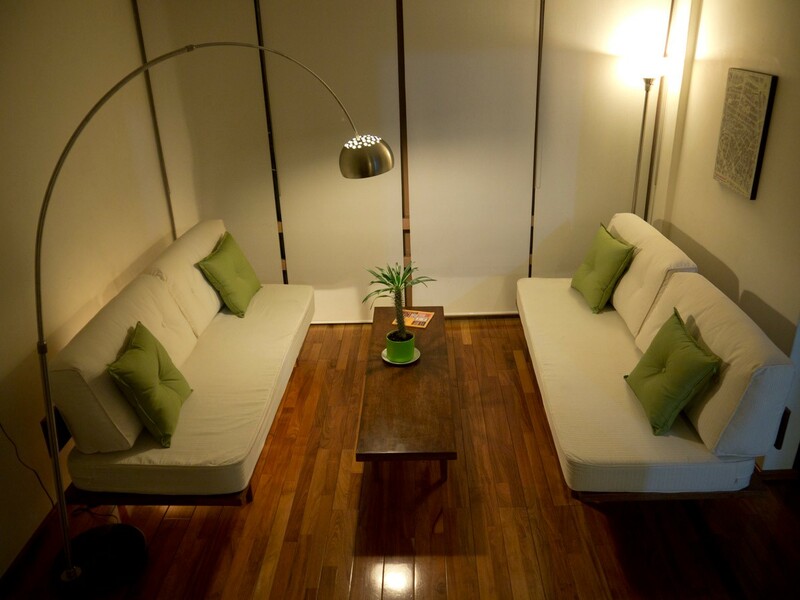 You are also mostly looking for a comfortable place to sit, with little thought on how it integrates with your habits or lifestyle. When you are up close to the fabrication process, you realize all the unnecessary anxiety involved in choosing furniture. When confronted by a wrong choice you stop thinking I can’t believe I wasted my money on this, and instead think I just need to improve the backrest and soften the seat. This change in thought is very notorious and a welcome change from post-shopping anxiety syndrome. There’s more: when you choose a local carpenter you are supporting local economy. 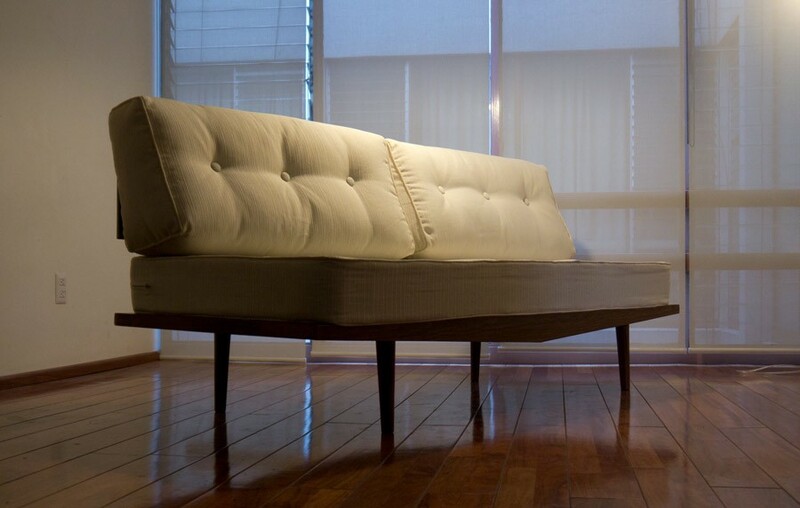 Your furniture does not cross the ocean to reach you, (reducing your carbon emissions). You can also observe and learn how it’s made. Once you understand how furniture is built, you are more likely to repair it rather than throw it away. In short it’s win all over. I share this in all honesty with the intention that you see that it requires no special talent. As an interaction designer and developer, clients reach me with poorly drawn wireframes and I interpret them into full-blown products. 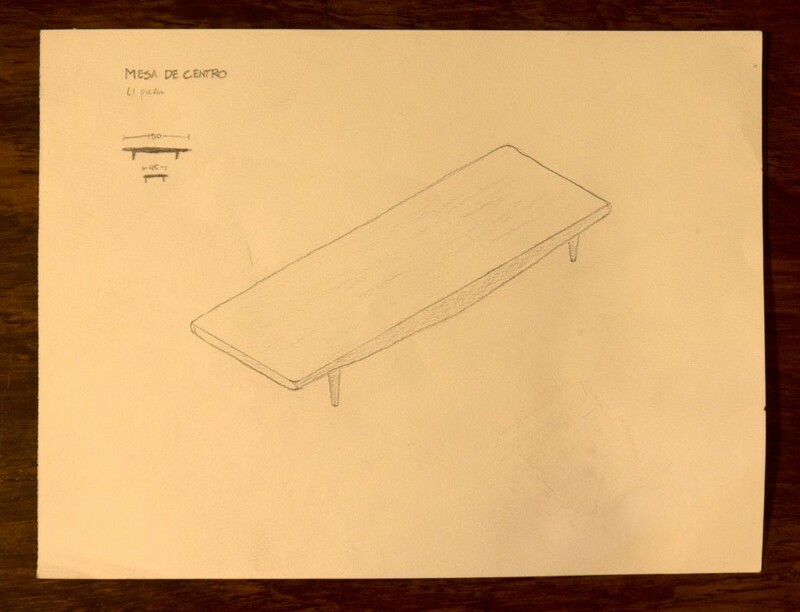 This is the same case: I went to the carpenter with crude drawings, but a clear idea of what I had in mind. The carpenter—an old experienced man working out of a crumbling workshop in Mexico City—did most of the magic. 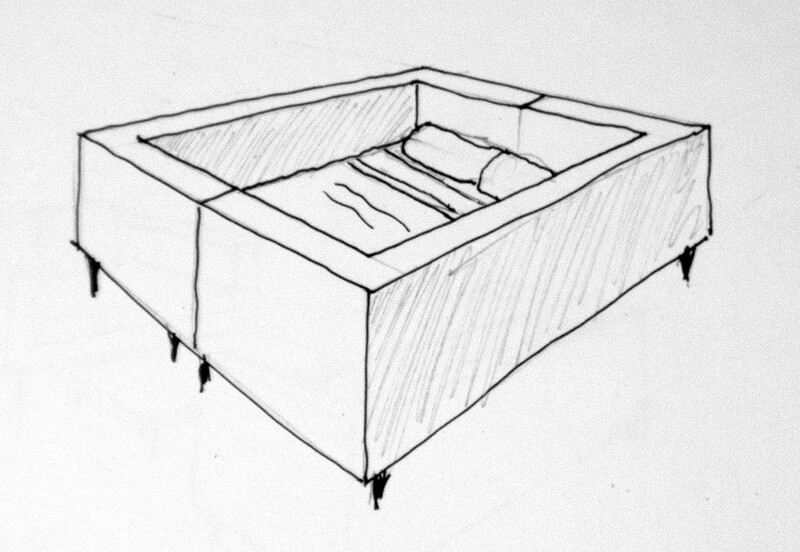 I considered creating prototypes of the furniture with cardboard so I could easily get a feel and improve them, but I decided against it. 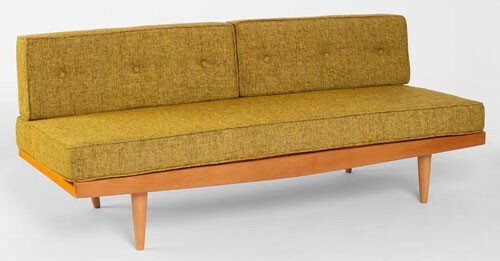 In practice I need real furniture because my home is unfurnished, so I considered this the MVP version, and as such I’d use the cheapest materials and services at hand. 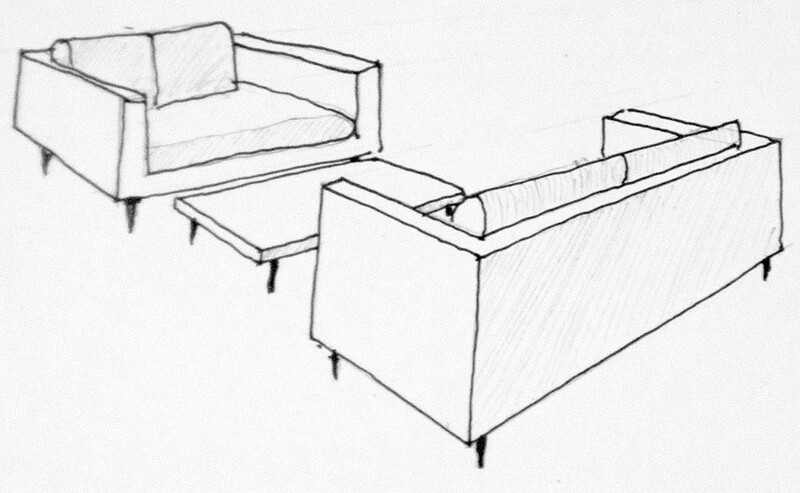 When the furniture reaches it’s end of life, I already know how to improve it to create a better version. 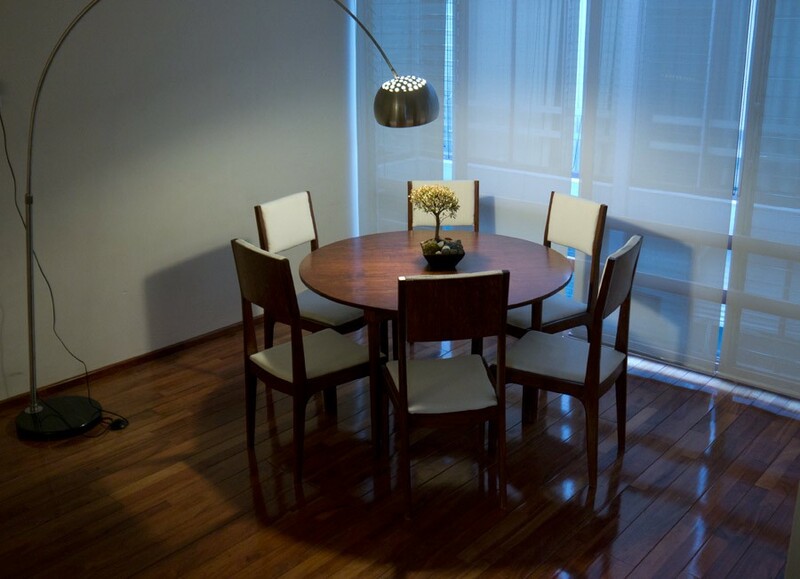 The total cost for six chairs, one dining table, two sofas and a coffee table was $1,150 USD in Mexico. I enjoy visitors, so after the essentials (desk, office chair, mattress, refrigerator and stove) the next priority are the common areas. I have also decided that my workplace is sacred, thus my home office will not be a makeshift bedroom. This means guests will sleep on the couch. How can I provide a comfortable experience? A second question popped up: I don’t own a TV. I don’t want a TV. Should you point the couches towards a TV replacement, say: a nice painting? Sounds boring. 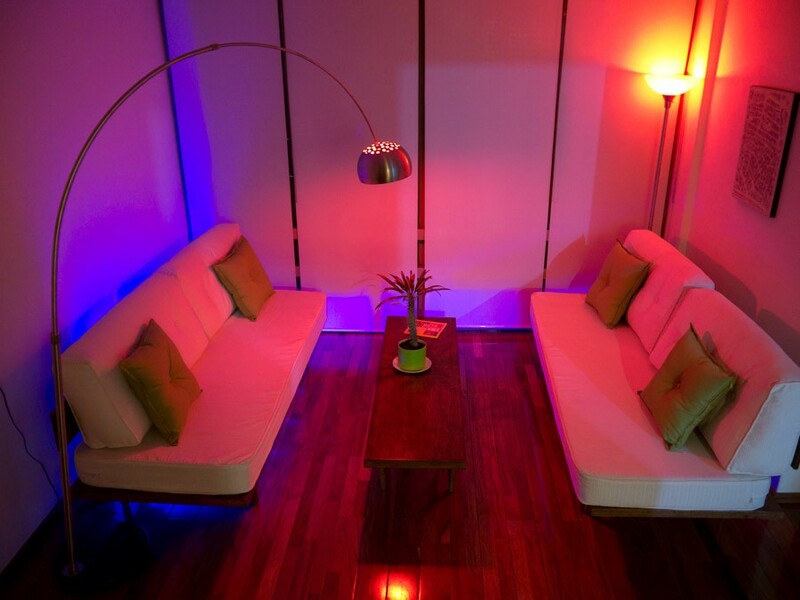 The answer, of course, is to change the typical living room layout so couches face each other. This means your entertainment is the person in front of you. Good, one could be sofa bed and the other not, but that doesn’t seem elegant. Let’s see what happens if we join them. 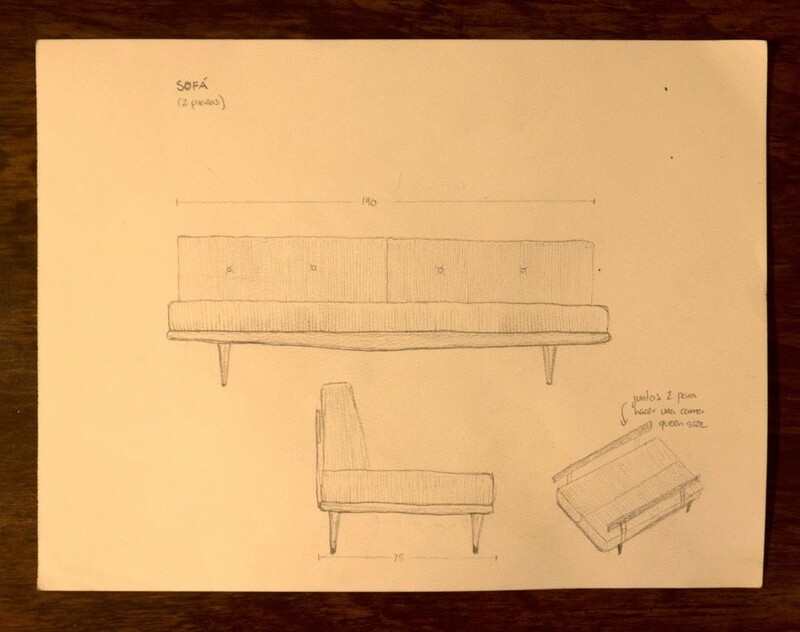 Aha, we arrived at the same solution but this is more professional, I’ll cheat a bit, I’ll get inspiration from this sofa, but I won’t show it to the carpenter, I’ll draw something similar and see what comes out. The carpenter told me he didn’t do upholstery, so I went to a shop where they quoted an outrageous price and I didn’t like any of the fabrics he had available. If I bought the foam filling and the fabric, perhaps someone with a sewing machine would be able to help me out, but who? Five minutes later I was calling mom, she told me she’d love to do it. I’d just have to spend a pair of days in Puebla, my hometown. So I went over there with some instructional YouTube videos downloaded into my laptop (there’s no internet at mom’s! ), we watched them together and then we got to work. It didn’t take long to figure out that we had some technical deficiencies: special sewing machine needles are used for the piping, and we were taking a sweet long time to get the simplest stuff started. Next day I went to an upholstery shop in Puebla and they quoted an extraordinarily reasonable price and they would have it ready by the next day. Jackpot. We enjoyed the rest of the day together and had a pleasant time. However, the process of trying to do it myself was tremendously instructive. When choosing the fabric at a cloth store allowed me to appreciate the texture, and as a bonus I could use the same fabric for the dining room chairs. I chose a light cream color under the reasoning that I don’t have kids or pets, so they wouldn’t get as dirty as expected. The only condition was that they would have to be easily washed, so every upholstery piece has a zipper to remove the filling. Washing all of it would probably cost me around $10 at the laundry around the corner. In retrospective, this was a mistake. I fell in love with a quite pricey fabric that gets dirty faster than I expected. I’m finding myself being careful with my feet, and getting nervous when wine is served. These kind of things. Next iteration I’m choosing between wine, whiskey or coke colors. I’ve always said that functionality precedes looks. This time I let myself be seduced and I regret this decision. Still, looks quite distinctive. The green cushions are custom made too. At $12 USD a pop it was a steal. I used Phillips Hue lights which I had around, and for which I hadn’t found a good use yet. You can get a quite funky look out of it. 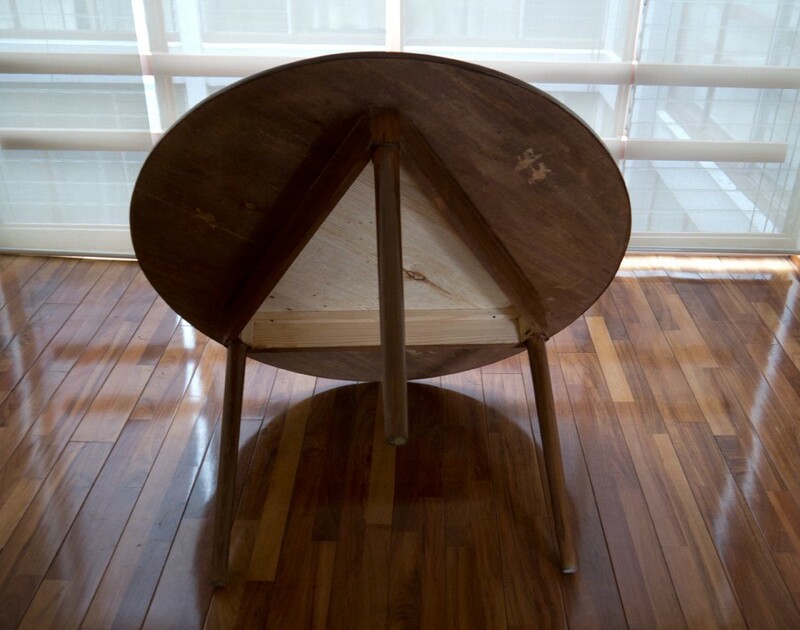 Scandinavian furniture often uses “sculpted” wood, which is wasteful. The carpenter just sculpted a part of the profile of the chair, and then used arches to imitate the forms I had drawn. 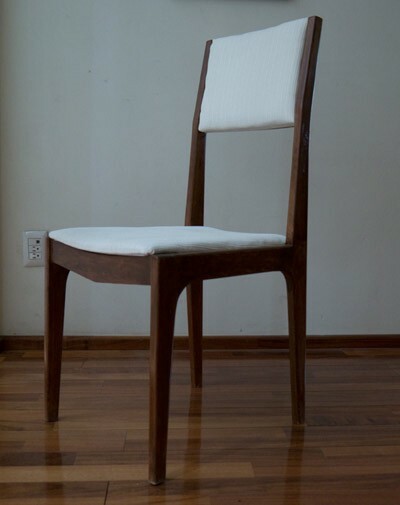 This reduces the amount of wood used and it is also functional, because it increases the carrying capacity of the chair, thus it is less likely to crack if one of your drunk friends drops himself on the chair. I think that hiding structure is a mistake, next version will be more honest about the structure of the chair. I wanted a round table because it allows for better conversation. More people are in your field of view, and there is no preferential place. Every place has the same status when the table is round. 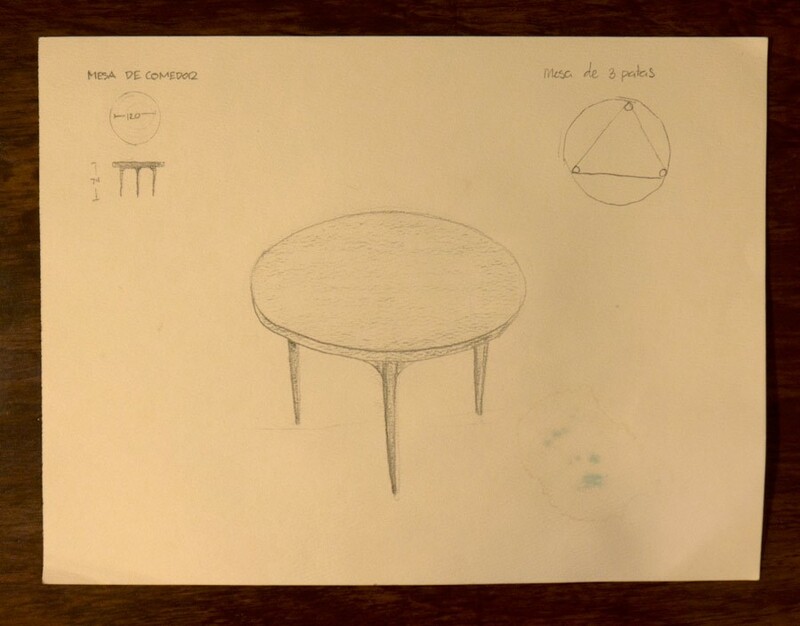 The problem with round tables is either a central column that prevents you from stretching your feet under the table, or bothersome table legs that—more often that not—end between your knees. So, the solution I found was using three legs and six chairs, this would mean that I would be able to place two chairs inbetween each leg. No more legs up your crotch. I wasn’t sure about the stability, so I asked my father—who is a mechanical engineer—if this was a good idea. He gave me the green light. That stain came from the carpenter’s workshop. His roof was falling apart. I wasn’t as pleased with the result. Seems it was done in a rush. The chair-pairs don’t fit between the legs because the legs are slightly inset. Fortunately it seems to be an easy fix, I will ask it to be modified in the next iteration. The good news is that the table is quite stable. It has already survived a night of debauchery. However—as a friend pointed out—the true field test is when someone dances on top of it. Not even Herman Miller test their products so throughly. 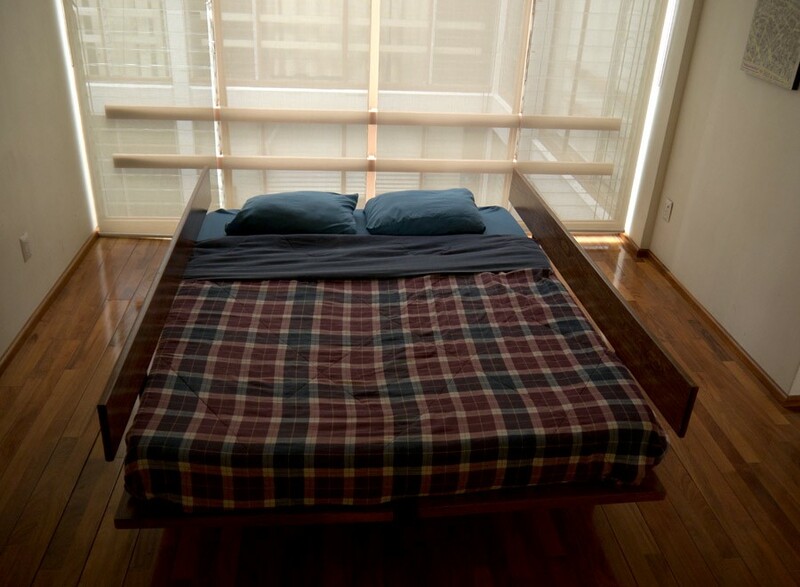 This experience left me wanting more; not only furniture-wise, but in all aspects of my life. Those horrendous plastic flowerpots I bought at Walmart? Replace them with self-made pottery. Cheap dishware acquired at the corner store? Take a ceramics course. Music blaring from ugly computer speakers? Make your own from high quality materials that go along well with your furniture style-wise. I want to get more hands-on with the process of building, it brings great richness into your life. 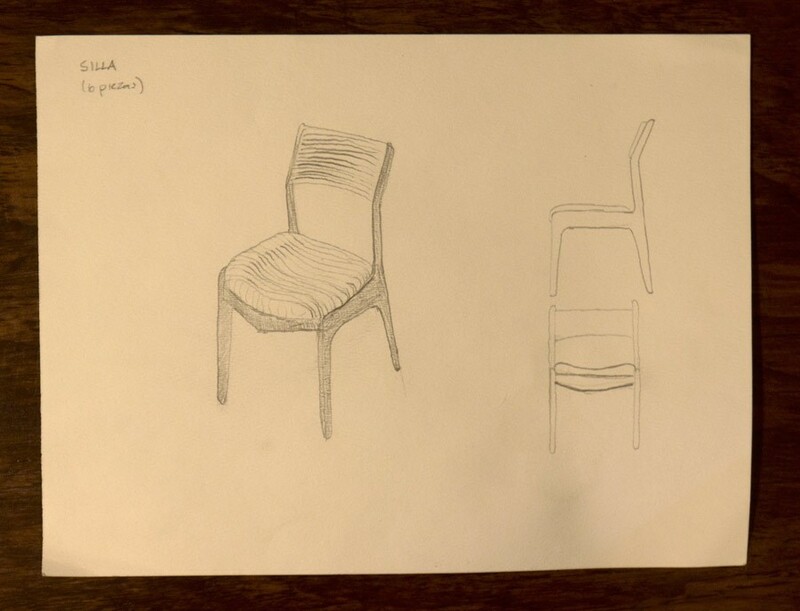 I now find myself looking intently at restaurant furniture to ‘compare notes’ on construction and design. I commend good taste in friends’ homes. I wonder how to make use of new and novel materials. 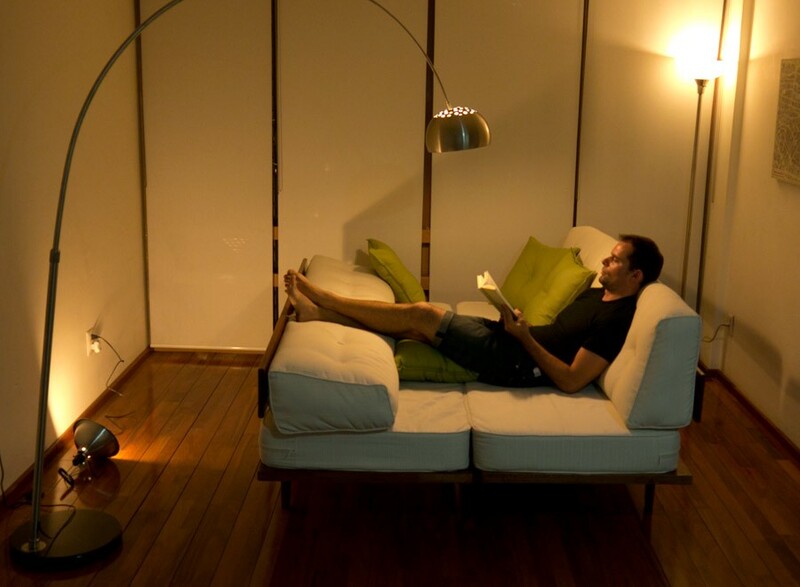 Knowing your furniture intimately also encourages you to play with it. Here’s me after finding the ideal set-up for reading. Not that I’d shuffle everything around just to read, but it was a pleasant discovery. I am a person. I do put labels on myself. I publish in the direction where curiosity leads me.